Google is updating its ad business to help marketers take advantage of the millions of searches being performed on mobile. The most notable change will arrive on Google Maps, which will allow companies to place a small logo over their physical location to make them stand out. These “promoted pins” will appear as users look at a map or are looking at the navigation view in Google Maps. Promoted coffee shops and gas station pins, for example, may pop up along a user’s driving route. Google is also adding the ability for advertisers to customize their business pages within Maps. Users will be able to see a company’s local inventory or find coupons for a particular store, assuming a business chooses to offer these options. The example shows a Walgreens logo on a map with a card that offered $3 off contact solution. 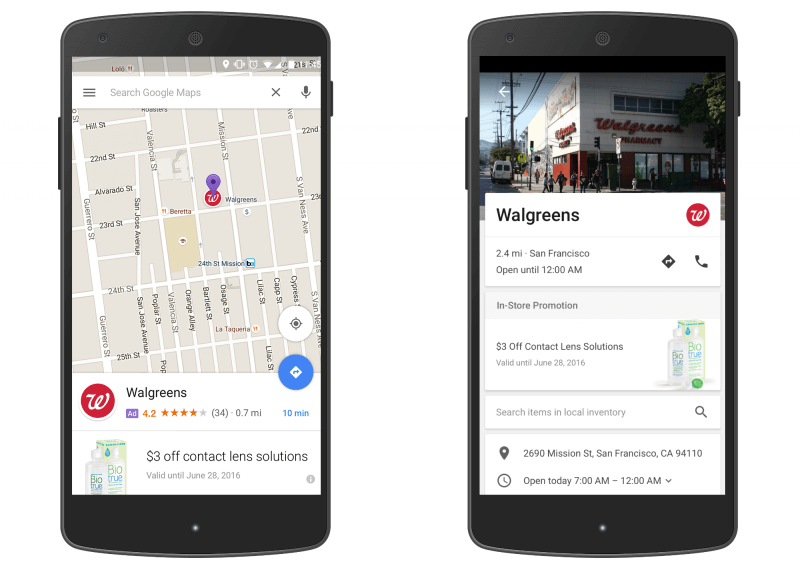 Google says that search ads can appear on the desktop and mobile versions of Maps. When doing a search for a type of business, those that paid for an ad could appear first in the results. These companies are identified with a purple “Ad” badge. Away from Maps, Google is making some changes to its mobile search ads to allow for more content. Advertisers will have 30 characters for a headline instead of 25 – stretching it to two lines – and the amount of space for the main body of text increases from 35 characters to 80. The company says having more information in ads increases click-through rates by 20 percent. “Nearly one third of all mobile searches are related to location. People’s online and offline worlds are colliding — whether you’re researching restaurant ideas for dinner on Friday night or looking for a store that sells rain boots in your size,” wrote Sridhar Ramaswamy, Google’s senior vice president of ads and commerce. As more people are performing searches on mobile rather than desktop, we’re inevitably going to see an increase in the number and size of ads appearing on the platform. While the new Maps features could be helpful, and may offer consumers some good deals, it will be down to Google to make sure our maps don't get covered with hundreds of promoted pins.